For those that are unsure exactly what defines a couture gown this article is for you. A couture dress whether it is a bridal gown or evening gown is created 100 percent from scratch— this means a custom design, executed with the finest materials and trimmings specifically sourced and cut to fit each individual brides needs and wants. 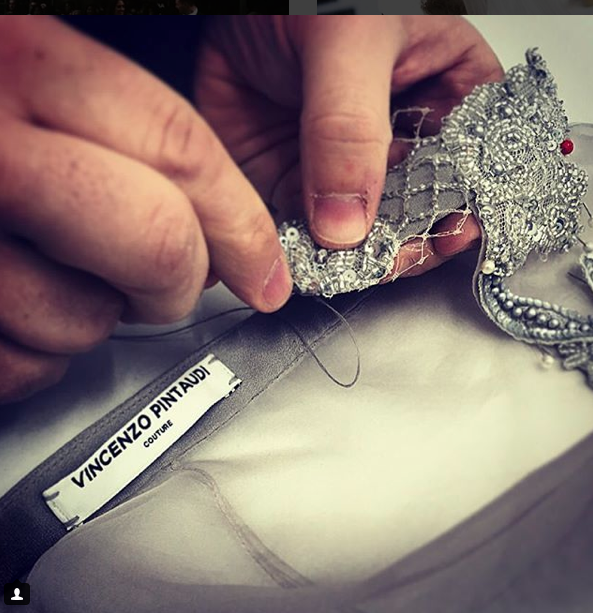 Of course every bride wants her wedding gown or special event gown to be unique, so working with a couture dressmaker and designer such as Vincenzo Pintaudi Couture ensures that the wearer can create a look that's completely their own. Some women need direction and advice in the shape and style which is most flattering to their figure, while there are other brides who finds inspiration from different dresses they love and may want to combine them into one dress. Then there may be the woman who has a very specific dress in mind, and cannot find a ready-made gown. Or it may be that just once in your life, you want to experience having a gown made just for you. The beauty is that you can add your own touch and personalise the style while working closely with one of Melbourne’s experienced designer/dressmaker on a very exciting and personal project. Besides the benefits of having a unique style which can be adapted and customised, other advantages of getting a gown custom made & designed is that there is higher quality and care taken every step of the way. From the one-on-one fittings with the designer, to precision of cutting and sewing. Because construction methods are not as per mainstream mass produced dresses would be, exceptionally skilled hand techniques can be used to achieve high end finishings of the utmost quality by a team of experience specialists. If you have a strict budget communication is crucial. As an experienced designer Vincenzo can work within a bride's reasonable budget if she's open to design modifications. This could involve altering the silhouette (shape) removing intricate details, using less labour intensive techniques such as applique of lace and hand beading and using different fabrications can help to reduce the cost of a gown. Vincenzo can make suggestions that will still incorporate elements that you really love. 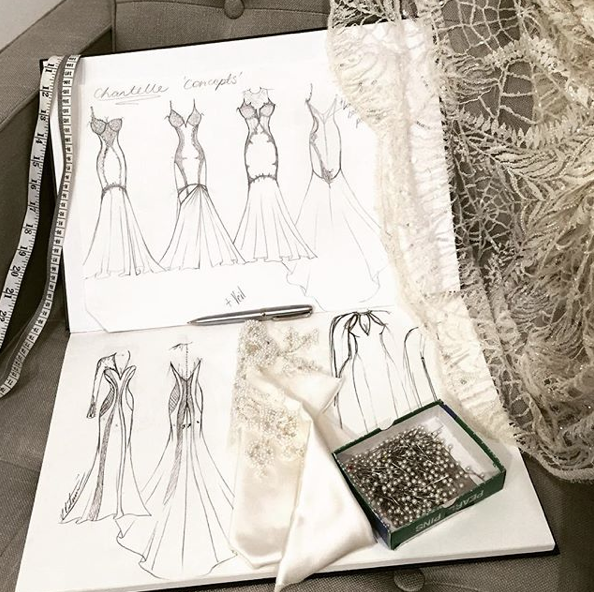 At the early stages of the design process, Vincenzo Pintaudi presents the bride with a range of proposed sketches which may incorporate versions of a style and a selection of fabric swatches. Once the basic design of the gown has been established the fun begins. Embellishments and fabrics such as silks, georgettes, mesh, lace panels, trimmings, crystals, pearls and beads can be sourced from his vast array of contacts and suppliers including fabrics and trims from Italy and France. Using only premium bridal fabrics are imperative, as the VP Couture brand is renowned on producing exceptionally high quality gowns. One very common change that brides will make along the way is regarding the detailing. For instance originally she may have wanted dry lace, (meaning no beads or crystals) but she then changes her mind and decides to go for a beaded lace with hand-sewn beads & crystals. It is definitely important to always ask questions throughout the process, particularly if you don’t understand something and this makes everything transparent leaving no areas of miscommunication. If it so happens that the changes a bride may like to make are too far outside their budget, then it’s a great idea to get the opinion of the designer on other fabrics or design choices that can be made, but that will still give a similar look. Communication is extremely important throughout the whole process. Ultimately, having a gown made from scratch can be a lengthy process and Vincenzo recommends that brides begin having their dress made ideally six to eight-months before the wedding. Of course if this is not possible, he can definitely work within a shorter timeline but this would depend on the detail of the gown and his schedule of workload for the month that the dress is due. One last tip is to always tell the designer from the very first fitting if the plan is to lose weight, as the designer will take this into consideration when making the gown. In this situation a bride may need a few extra fittings to ensure that the dress is fitting accordingly. If you so happen to lose a lot of weight or gain a lot of weight just before your final fitting, there is a chance that the price of the dress will increase as the dressmaker will have to make major alterations last minute. This includes unpicking already finished work which is very tedious and time consuming. But it’s also very important to have trust in your designer’s ability of over 24 years of experience. Trusting the professional will add an ease to the process on your end. Naturally some may find it difficult to allow another person to have creative control, however remember that you are dealing with a professional so you have every reason to trust their opinion and technical experience. What Vincenzo Pintaudi often delivers exceeds all expectations. Vincenzo makes the whole process fun, professional, creative and a very personal experience. Like most creative projects it can organically evolve, so be open minded and prepared for change. He absolutely assures that as long as you enter into the experience open-minded he assures to create a gown that fits you like a glove and enhances your best features. A GOWN SKETCHED BY VINCENZO PINTAUDI FOR HIS CLIENT …. Hand couture techniques define the quality of a finished masterpiece. It is these finishing touches of a garment which will set it apart between a mass production gown and a breathtaking bespoke piece.